Since this is my first post here at Hero, Heroines, and History I thought I might take a minute to introduce myself. I’m Amy Lillard and I write a variety of genres. Recently I got back to my first love, historical romance. My primary genre is Amish romance, but I started writing with historicals, went on to contemporary, then circled back around. Currently, I’m working on the follow-up to my first historical novella, The Gingerbread Bride, which releases next month. The Wildflower Bride, slated to come out next summer, features a Scottish hero who now lives in America. Ian MacGruer is the best man at his childhood friend’s wedding. And what would any self-respecting Scotsman wear for such a special occasion? Why a kilt of course. And so the research begins. That should be easy enough. All I wanted to know was what type of kilt/tartan/plaid Ian would wear for the event. But it seems there’s much more to kilt wearing than meets the eye. (No pun intended.) Wikipedia defines the kilt as “a knee-length garment with pleats at the rear, originating in the traditional dress of men and boys in the Scottish Highlands of the 16th century. It is most often made of woolen cloth in a tartan pattern.” Kilts are easily the national dress of Scotland. And everyone knows that each clan has a tartan plaid of their own. But it goes a little deeper than that. As late as the 1830s, tartan was defined as a “plain cloth without any patterns.” The Scots introduced “plaid” patterns to the cloth and today the two words are practically synonymous. Both refer to patterned cloth, whose pattern is the interweaving of vertical and horizontal stripes of varying widths in multiple colors. But there was a time when the words were separate from each other and referred to different pieces. Tartan originally meant a type of cloth, and not the pattern. It comes from the French word tiretain, which references a woven cloth. But a plaid is the upper part of the garment we call a kilt. It’s the rectangular woolen “scarf” or cloak draped over the left shoulder of Scottish Highlanders and worn as a cloak. (A little more about Plaid: the word is derived from the Scottish Gaelic language and originally means blanket. Today, of course, plaid refers to any cloth with the tartan pattern.) The Scottish kilt dates back to the early 16th century. But these garments weren’t the colorful tartan that we’ve come to expect today. Being self-dyed, the material was dull white, brown, green, or black. It wasn’t until weaving technology improved in the late 18th century that they grew closer to the garments that we imagine when someone says kilt. During my research, I found that in the early 19th century (the time frame for my story) Ian would indeed wear a kilt for a formal/special occasion. After searching for his last name in a Scottish registry, I discovered that he would be from the clan Fraser. 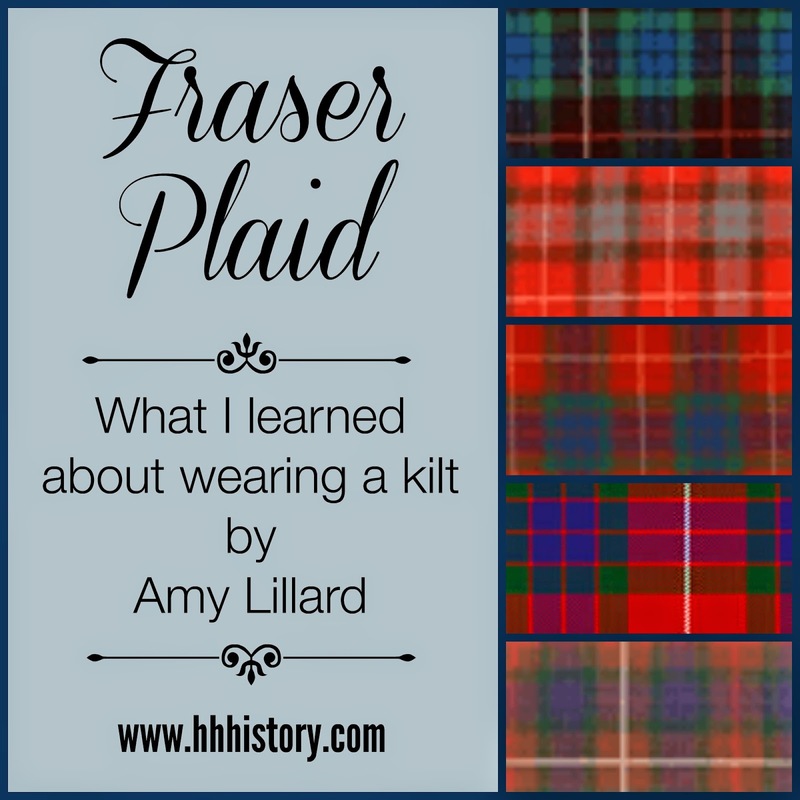 I ran a search for his clan’s plaid, but found several choices of tartan design belonging to the Frasers. The colors are mostly the same though the specific weave is different.  The knee-length kilt didn’t develop until the late 17th-early 18th century. 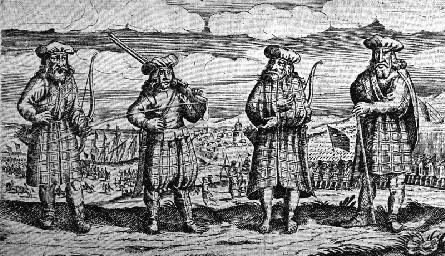  King George II levied the Dress Act of 1746, which made it illegal for the Highland regiments to wear garments of Highland dress, including the tartan kilt.  The walking kilt (one that reached the knees) became a form of protest against the oppressiveness of the English government.  The ban was lifted in 1782, but by then the kilt became the enduring representation of Scotland itself.  There are over 3500 tartan patterns today.  Because the tartan pattern cannot be broken in the weave, almost all are made by hand even today.  Modern-day kilts have twenty-nine pleats and use eight yards of tartan fabric. The biggest question concerning kilts has been what does a Scotsman wear underneath his? Oh, there have been countless jokes, most which don’t bear repeating. But the truth of the matter is most Scots (at least through history) did indeed wear nothing underneath. Why? Because kilts were often used in battle. It was purely for the convenience of taking care of their personal business quickly in the field. Not nearly as romantic as some would think, but the truth all the same. Isn’t that the way of it? 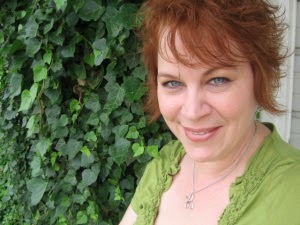 Amy Lillard is a 2013 Carol award-winning author. She attributes her writing to her love reading romance novels from contemporary to Amish. A transplanted Southern belle, Amy was born and raised in Mississippi. She now lives in Oklahoma with her husband of twenty-five years and their teenage son. The family is rounded out with two cats (one of which is a Hemingway) and a lazy beagle. Check out Amy’s latest release, Take Me Back To Texas, Book 1 in the Loveless Texas Series. Take Me Back To Texas is an inspirational contemporary romance about second chances and coming home. Hi Amy, welcome to HHH, This was SO interesting. I had no idea there are so many different types of plaid. Thank you for sharing! Thanks for the welcome! So glad to be here! I had no idea there were so many plaids either. :) Thanks for reading! Welcome aboard! My husband's family uses the Black Watch tartan, which I find especially attractive. Hi Amy! Thank you for the interesting and informative post!